Wow, has it been hot. Where I live — and now in Paris, where I’m spending a chunk of August — summer has been one heat wave after another. What’s a perfume-loving girl to do? Turn to light, fresh fragrances, of course, like Chanel Paris-Venise Eau de Toilette. 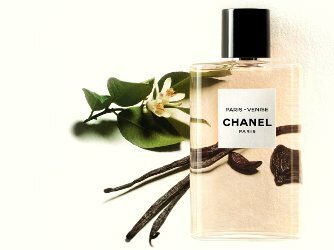 Paris-Venise is one of the three Eaux de Toilette from the new Les Eaux de Chanel collection (the others are Paris-Deauville and Paris-Biarritz). Perfumer Olivier Polge developed all three. Chanel describes Paris-Venise as: "A fresh oriental trail inspired by the exotic and enchanting city of Venice, one of Gabrielle Chanel's favorite places.” Its notes include citrus, neroli, red berries, iris, Grasse geranium, cedar, amber accord and vanilla. Of the three Eaux, Paris-Venise is the one that grabbed me. The idea of an oriental cologne was intriguing. Yes, I like a zesty cologne on a hot day, but I don’t always want to smell like a golf club shower stall. Yet I think of oriental fragrances as too complicated and ambery to be refreshing. Paris-Venise does the job nicely. Its citrus veers more toward neroli than tart lime, and a hint of currant gives it the deliciousness many oriental fragrances have without turning sweet. Its cedar and geranium make Paris-Venise tingle in the nose. Subtle vanilla and amber smooth its edges. Mostly, Paris-Venise doesn’t come off as particularly complex or fussy, and I mean that as a compliment. Think of it as a glass of barely sweetened, vanilla-fruit-infused iced tea when you’re thirsty, instead of the lemonade you usually drink. It’s not that Paris-Venise smells like iced tea, but that relative to traditional colognes, you might think of it that way. To keep the beverage analogy going, Chanel Coromandel or Coco might be a Bordeaux wine to Paris-Venise’s tea (and, for you oriental lovers, a bare dab of Coco would be a nice way to top off Paris-Venise when the day cools). As you might expect, Paris-Venise has modest sillage unless you really spray yourself down. After a few hours, it has mostly vanished from my skin. One more note: The Paris-Venise bottle is a throwback to old No. 5 cologne bottles with its tall, rounded sides and heavy, engraved cap. It feels good in the hand, and although, at 125 ml, it’s a large bottle, it’s slender enough to be easy to spray. Its atomizer delivers a satiny mist. What fragrances do you turn to in a heat wave? Have you found a good cologne that’s not a citrus salad? Chanel Paris-Venise Eau de Toilette is $130 for 125 ml. It’s also available as a body lotion and as a bath and shower gel. It’s available at Chanel boutiques or directly from the Chanel website. Hi Angela! Paris-Venise was my favorite out of the three Les Eaux. Lately I’m wearing a lot of fresher fragrances as we are also having a heatwave in Poland. Latest favorites of mine include Parfumerie Generale Komorebi, Liquides Imaginaires Succus, VC&A California Reverie and Jacques Fath Green Water. Today is supposed to be the last real cooker of a day, thankfully! I think I’ll try the Paris-Deauville today. It has a chypre feel I like, but Paris-Venise is still my favorite. I have a friend that is shipping this one to me and I am so excited to get it. I’m in the mood for something light but not necessarily a citrus bomb, so this is going to be on heavy rotation doing this heat wave we have here in Europe. I totally adore the bottle and I love that the spray gives a good mist. Philosykos reminds me of how I WANT to be feeling right now: cool, leafy, green, and like I’m sitting on slightly earth. And you described it so well. I couldn’t say it better. How deliciously refreshing it is. It has a lovely berry top note and the neroli and geranium is twirling around and dancing with the vanilla and amber. Like a perfect blended ice tea. Not one of those fake peach or icy minty ones. I love that the vanilla and amber is humming, not overwhelming. I was a bit afraid that it would be a vanilla bomb. Well done Olivier Polge. Bravo. I’m so glad you’re enjoying it! I’ve been appreciating Paris-Deauville lately, too, mostly for its wonderful moss. Warm (literally) greetings from Cologne which is just a three hour train ride away from Paris! We had an incredible summer but the temperatures are a challenge. I rely on Azemour les Orangers and Tzor’a by Anat Fritz but I could definitely use something new. Have to try the Chanel, especially as orientals usually give me a hard time. This sounds as if it might work for me. Azemour les Orangers! I forgot about that one. It would be perfect right now! I bought a bottle of Paris-Deauville but haven’t tried Venise on skin. Need to give it a try! I’m glad you mentioned the bottles. They are really lovely and the sprayer feels super fancy! Forgot to mention, I’m liking Deauville in the heat and also wear a lot of Bvlgari Green Tea this time of year. Good old Green Tea. A classic. The bottles are really nice, aren’t they? They feel sort of modern and old fashioned at the same time. How funny, I’m actually wearing some vintage Coco EdP today! I wore the parfum to bed last night and wanted to keep the party going. I haven’t smelled these yet but they are high in my list. I think they’re not super easy to find, but Paris-Venise and Coco could be good friends! I have a local boutique but that mashes me feel tired just thinking about it. Cologne should be refreshing, not tiring! I know what you mean, though. Either AG starry night or mandragore, right from the fridge. Oh, refrigerated Mandragore sounds like heaven right now! This sounds great. I am hoping to try them all! I hope you get the chance! It’s not that they’re wildly original, but they’re nice and surprisingly affordable. Thanks for writing reviews during this hot weather and while visiting Paris, Angela! The IUNX eaux would be terrific in this weather! Great list! I dislike citrus and colognes in general, so I wear SL L’Eau Froide, Bulgari au Thé Bleu, and the edt versions of AdP Iris Nobile and Gelsomino Nobile. Not refreshing but summery in a beachy, suntan way is Atélier Cologne Blanche Immortelle. It smells like warm skin after a day in the sun to me. I also like FM Eau de Magnolia and Lys Mediterranée in the heat. I have a friend who’s been wearing Lys Mediterranée in the heat, and I was skeptical since it’s such a showstopper, but it works! I enjoyed SMN vintage Melograno Cologne this summer…definitely not a citrus and reminds me very much of vintage Emeraude. Is vintage Melograno a lot different from the current Melograno? I remember trying it and liking it enough to consider buying a bottle–and then not buying a bottle. Haven’t a clue…all I know is that the bottles are different. I am sure they are similar enough. I only tried the vintage because it was gifted to me…prior to that I did not even know about this niche house! Either way, it does sound nice. Try keeping a bottle of Eau de Cologne in the fridge and then spraying and respraying as the day goes on. (An eau de cologne should be sufficiently light to allow the respraying). I keep a bottle of Jean Naté in the refrigerator for just this kind of treatment! Aliage is the best for the very hottest conditions. I’ve only lived in dry-heat climates, though, so can’t advise on suitable scents for humid weather. Aliage is great in humidity. Cuts it like a knife. Good to know, for future travel! I like it, too! Plus, it smells wonderfully old fashioned to me, in the best way. Aliage is great in humidity. One of my favorites. Oops, forgot to list Guy Laroche Fidji, a warm-weather fave which is versatile in that it also suits milder temperatures. The name alone earns it a spot on the list! I recently found my decant of Knot, and I do like it in the summer. Aliage is so wonderful, too! Azuree usually sounds wonderfully summery to me, but is better when it’s not sizzling hot out. I agree – Azuree is for days when it’s warm enough to relax in a lounge chair by the pool, not when it’s so hot you have to flee indoors to the air conditioning. How do you think this would work on a man who tends to distinguish between male/female scents? My husband will wear most of the Hermès eaux and has Colonia and SMN original eau. If he’s very sensitive to female v. male scents, he might not go for this one. The fact that the sillage is relatively light is always a good sign for a summer type fragrance. and the soft creamy base is also a plus on a hot summer day. Nectarine Blossom & Honey Cologne (Unisex) by Jo Malone is another nice summer fragrance that has a very soft sillage. I have a friend who wear this one wonderfully. The JM orange blossom, too.